Turkey neck, double chins, and horizontal “tech neck” lines often make us look older than we are. Most people take really great care of the skin on their faces but neglect the skin on the neck and decolletage. The good news is that we have non-surgical solutions at Skin by Lovely that can treat these concerns. Find out below how you can achieve a neck lift without surgery in Portland, OR, and Santa Monica, CA. Sagging jowls are caused by two things: loss of facial volume in the mid-face (cheeks) and loose skin. You can blame the breakdown of collagen and elastin production as well age. However, we offer many non-surgical solutions to restore a tighter, smoother, more youthful-looking jawline with Botox and dermal fillers. When injected along the jawline, Botox and other botulinum toxin treatments like Dysport will tighten the muscles, creating a smoother, more contoured look. We can also inject Botox into the masseter muscle to soften a masculine-looking jawline, making it appear softer and more feminine. While tightening of the jawline muscles is one way to reduce the appearance of jowls, another method we use is dermal fillers in the mid-face. Juvederm Voluma, from the makers of Botox, and Restylane Lyft are cheek fillers that restore lost facial volume. As we age, those fat pads begin to disappear. With this loss of volume, the skin begins to sag, causing jowls. When injected into the cheek area, Juvederm Voluma and Restylane Lyft restore that lost volume while gently lifting sagging skin to reveal a smoother jawline. Now that your jawline is taken care of, our next treatment for a neck lift without surgery involves fat reduction. While we work to add volume to your mid-face, we want to reduce volume beneath your chin. Until a few years ago, the only way to achieve fat reduction beneath the chin was through liposuction. Liposuction is a plastic surgery procedure that involves a cannula inserted beneath the skin to suction away excess fat cells. While very effective, liposuction requires downtime and carries heavier risk than non-surgical fat reduction. 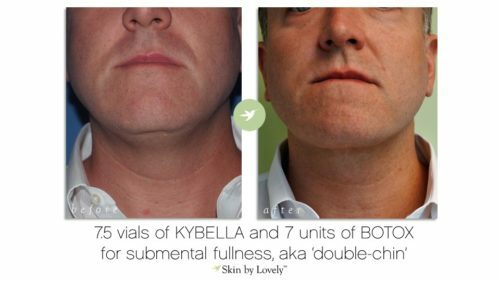 When Kybella became the first FDA-approved non-surgical double chin treatment, the public and media were buzzing about the possibilities. Since then, Skin by Lovely has offered this injectable fat dissolver to patients in Santa Monica, CA, and Portland, OR. While results are more gradual than with liposuction, downtime following each procedure is minimal. As it’s a non-surgical treatment, risks are greatly reduced. We administer Kybella via a series of injections during each treatment session. Following treatment, it gets to work melting away targeted fat cells in the submental area. Those fat cells die off and are reabsorbed for removal via the body’s lymphatic system. After a series of treatment sessions, patients achieve their desired results with a smoother, more contoured jawline and neck. Jawline rejuvenation? Check! Double chin reduction? Check! On to the neck! We have numerous treatments for tightening and smoothing the neck area to achieve amazing non-surgical results. These include Botox, dermal fillers, and microneedling treatments. What About Deeper Horizontal Neck Lines or Tech Neck? For those deeper neck lines, we can use dermal fillers. These fill in the lines, revealing a smoother area. 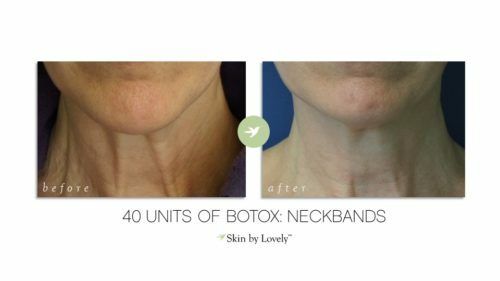 For a neck lift without surgery, we’ll often use Belotero Balance, Juvederm Volbella, or Restylane Silk. Microneedling, or collagen induction therapy, uses very fine needles to cause microscopic punctures in the skin. This stimulates natural collagen and elastin production to heal the area, making it appear more youthful. The collagen acts as a scaffolding for the skin while the elastin helps the skin behave more elastic so it can “bounce back” and remain contoured. A series of treatments is required to see results, however our patients agree that it’s worth it! We understand that you want to look your best without looking “done.” That is why our aesthetic injection specialists are dedicated to natural-looking results with injectables like Botox and dermal fillers. In addition to providing patients with a more youthful look, we train other providers on how to become injection specialists. Students travel from all along the western seaboard to attend courses in our Portland practice. There is no shortage of Botox and dermal filler practices in the Los Angeles area. However, we have something that other LA-based practices do not have: focus. While other Los Angeles practices offer lasers, body contouring, and even weight loss services, Skin by Lovely is different. We focus on Botox and dermal filler treatments almost exclusively, making us one of the top 20 Botox clinics in the country. This focus makes us true experts. Additionally, we educate other providers on the use of injectables in facial anti-aging. In addition to traveling to our Portland practice to teach at Injection U, we also travel around the country and into Canada to lecture and provide hands-on training for Allergan, the makers of Botox. Why would you go anywhere else? Are you ready to learn more about the possibilities of a neck lift without surgery? Schedule a consultation with one of our injection specialists today. We will take a full medical history, examine your areas of concern, discuss your expectations and desired results, and move forward with a treatment plan that’s catered to you. We look forward to meeting you.